The Cleveland Browns started hotter than hot. And perhaps showing signs of a city reeling from the Reds crushing playoff loss, Cincinnati started colder than cold. Coming off his four-game suspension, Joe Haden intercepted Andy Dalton's first pass, setting up a Phil Dawson field goal. D'Qwell Jackson and the defense dominated Cincinnati--keeping Dalton and Co. in negative yardage for the first quarter. The Browns, though, will be the Browns; poised to take their largest lead of the season, Mohammed Massaquoi fumbled on Cincinnati's 13, killing any momentum. Cincinnati responded by marching down the field. Brandon Tate's 70 yard catch-and-run put the Bengals on the Browns 17. Two plays later, another Tate reception gave Cincinnati a lead they wouldn't relinquish. A Brandon Weeden interception on the next Browns drive set up the first of four Mike Nugent field goals, giving Cincinnati a 10-3 lead going into the half. Excepting three big plays, the Browns Defense looked strong, keeping Cincinnati out of the endzone in the second half. Cincinnati, though, learned from their Week 2 performance and held Trent Richardson to 5 yards. Without any running game, Weeden couldn't manage the offense.Cleveland marched into Cincinnati's red zone late in the fourth, but their chance to put victory within reach came up empty. Four consecutive Brandon Weeden incompletions sealed Cincinnati's win. Perhaps its time for sports fans of Cleveland Ohio to look ahead to April's NFL Draft. 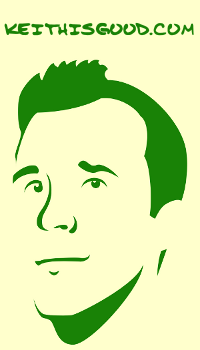 TSB 2013 Predicted: T.Richardson; 9 carries for 5 yards. What Happened: T.Richardson; 14 carries for 37 yards. With T-Rich going down, Montario Hardesty took over, rushing for 56 yards on 15 carries. Added together, Browns RBs carried 29 times for 97 yards. Tecmo was way off here. Even with TSB usually skewed toward lower completion rates, Weeden performed much better than forecasted. BOOM GOES THE DYNAMITE! 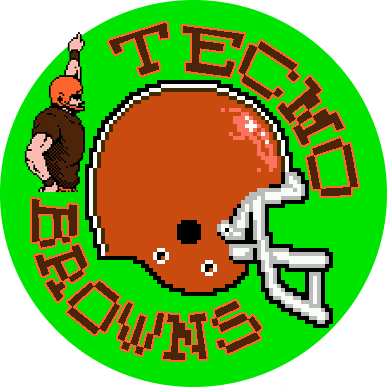 Tecmo Super Bowl 2013 finally gets one wrong. 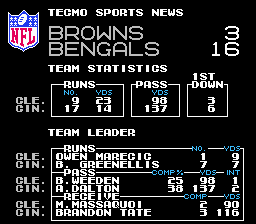 Tecmo seemed close in approximating Cleveland's Defensive performance, but the Bengals are in some sort of funk right now that is beyond any mathematical model.